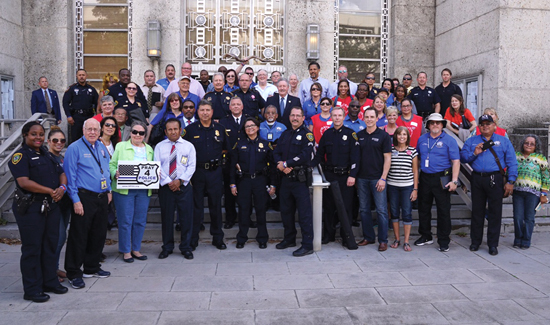 Let’s Pray Houston, a project initiated by the Houston Police Officers Union, was so successful it’s now spreading like wildfire across the state of Texas. Above: some of the folks who are involved. At right are Houston officials including Doug Griffith (to left in back of the police official on right). Houston Mayor Sylvester Turner and other dignitaries talked about why the event was so important and its ultimate goal of bringing the police and the communities they serve back together. The mayor has been nothing but enthusiastic. He noted that it was a great event for Houston and it’s even greater now it’s gone statewide – police and the people praying together. Police” and “Let’s Pray Texas” wristbands to the groups of people who participated. our nation and our local communities will be protected from harm,” Griffith said. The Houston Police Officers Union is an official member of PubSecAlliance.